Enjoy a bird’s eye view of London city and it’s impressive features including the Houses of Parliament, the River Thames and Big Ben with an enjoyable ride on the London Eye. Spend half an hour travelling up and down this architectural wonder and take plenty of photos of you and your travel companions while you enjoy the high life over the city. The London Eye not only provides interesting sightseeing opportunities for your everyday tourist they also tailor make rides for couples with Valentine's Day events and large groups and school classes that are looking to make a day of this experience. You can also hire your own private capsule and enjoy an unforgettable view over London with your partner, friends and family and fiance to be. While booking your London Eye experience online you can also book your river cruise along the River Thames for before or after your ride on the big wheel, and you can save 10% compared to what you’d pay at the gate. Enjoy live commentary on your cruises, presented by expert guides that bring the city to life. An audio commentary is also available in French, German, Spanish, Dutch, Italian, Russian, Japanese and Mandarin. Originally the London Eye was intended as a temporary structure and had planning permission for just five years. After these years were up it was supposed to be dismantled and transported to a new location, but with millions of people boarding it every year, its popularity prompted its lease to be extended. Today it is a permanent fixture on the London skyline and a beautiful symbol of modern London. Take learning to new heights with a class trip on the ultimate 360° learning experience, and book online to save up to 55% with school advance book rates. Your class trip to the London Eye will include the 135m high journey and a classroom in the sky that can be tailored to cover curriculum links in History, Geography, Art and DT as well as an on-board workshop and a cruise down the River Thames. The London Eye school experience helps bring learning to life with interactive features and a real view of the city’s landscape, all of which will help your students to take in much more about London and it’s interesting past, architecture and tourism. School experiences can also be extended or combined with visits to Shrek’s Adventure or the Sea Life Centre, there’s also plenty of great flexible booking options available to ensure your experience fits around your schedule and pupil’s requirements seamlessly. Book a London Eye private capsule and enjoy an unforgettable experience overlooking one of the most vibrant cities in the world. Host a group of your friends or colleagues with a selection of enhancements available including chilled champagne and canapes. Spend quality time with your family and friends overlooking the spectacular views of London, or treat your partner to 360 views of the city whilst sipping on a glass of chilled Pommery Brut Royal Champagne and enjoying a luxury box of Hotel Chocolat Pink Champagne Truffles, all served by your own personal host in the Cupid’s Capsule. You can also use the private capsules to propose to that very special someone or to treat an employee, your parents, or friend with birthday capsules. There’s even the option to enjoy your wedding day on the London Eye with a wide choice of wedding ceremony and reception packages available. There’s also great packages on offer for hen and stag parties; a great way to celebrate the bride and groom-to-be before the big day approaches. What is the London Eye’s opening times? The London Eye is open daily from 11:00 - 18:00. What is the London Eye’s address? The London Eye, Riverside Building, County Hall, Westminster Bridge Road, London, SE1 7PB. To make a school booking please complete the booking form here. Alternatively, you can speak with a member of the school's team here. At 135m, the Coca-Cola London Eye is the world’s largest cantilevered observation wheel and also the UK’s most popular paid-for visitor attraction. Launched in 2000, the London Eye has since won over 85 awards for national and international tourism, outstanding architectural quality and engineering achievement. With more than 3.5 million visitors each year, the London Eye allows tourists to observe the impressive views of the city of London from above for a great affordable price. 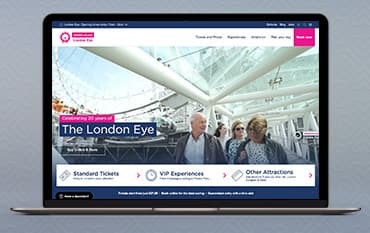 Book your visit online with a London Eye discount code from us and you can enjoy an even better price on your tickets compared to the price you’d pay at the gate.